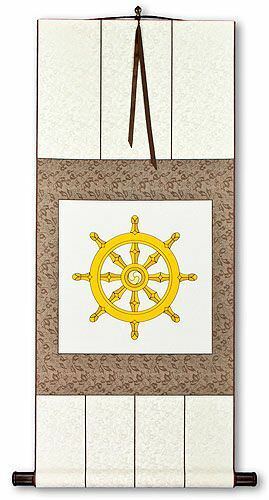 Artwork Panel: 30cm x 50cm ≈ 11¾" x 19¾"
Silk/Brocade: 38.8cm x 113cm ≈ 15¼" x 44½"
Width at Wooden Knobs: 47.8cm ≈ 18¾"
This is a print of a Dharmachakra, the Buddhist eight-fold path depicted as a wheel. This wheel is printed on very expensive handmade Japanese Unryu Kozo which translates as Dragon Cloud Mulberry. While not very visible in the images here, the paper has vivid white fibers throughout. It gives the giclee-printed symbol on this artwork a unique and special look. I am really happy with the way these came out. 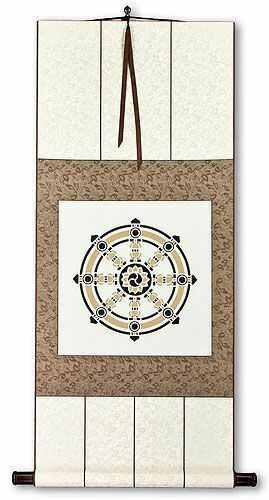 The artwork is mounted as a handmade two-tone silk brocade wall scroll. 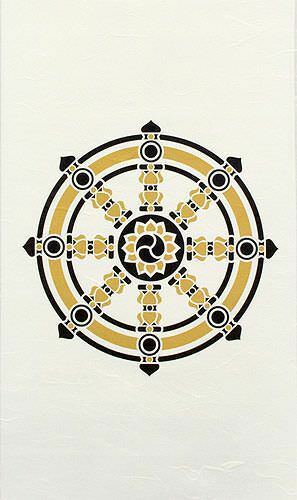 The result is a beautiful and elegant presentation of the legendary Wheel of Buddhism. The print was created on my fine art giclee printer using U.V. inks. If not put in direct sunlight, it should last at least 50 years without fading.